This month has been hard, harder than usual. So another fitting title came to mind, Grateful This Month is Over. However, the word thanksgiving makes me smile, so it quickly became my preference. Sammy at 22 years old. The first two days in November were uneventful, like the calm before the storm. The cliché is most fitting due to the unseasonably nice and warm weather we were enjoying. On the third day, my month fell apart when our twenty-two-year-old cat, Sammy, disappeared. He seemed anxious that day, meowing and pacing the house. The weatherman predicted a storm coming and I assumed Sammy sensed it too and wanted to go outside to enjoy the nice weather while he could. I let him outside and took advantage of the empty house by vacuuming. When I finished, I opened the back door, but he wasn’t there. At this point I wasn’t too worried and thought he just ventured farther than usual. I went back inside to complete a few more chores. The wind started to howl and it was dark. He wasn’t there on my second check. I earnestly searched all his favorite outdoor spots to curl up, exploring every possible place in our yard and garage. When he wasn’t there I got in our van and searched the streets. No Sammy. Did he run away to die? For the past year I’ve joked he was in hospice care because last November I brought our outdoor cat inside, due to wounds he received in a cat fight. I really didn’t expect he’d survive then, but wanted to make his last days comfortable and happy even though he often triggered my asthma. He was my irrigation buddy and kept me company every time I worked out in the yard. He was there for us when our children grew up and moved away. A portion of our garage became his apartment, which he could freely go in and out of during the day, but closed in at night. He was there for me every time I came home, which I appreciated, especially during the times Mark was hospitalized. We’ve put a cat down before and I wasn’t ready to do it again despite his old age. I hoped Sammy could pass naturally in our home with us by his side. It’s hard not knowing what happened to Sammy. I feel cheated I didn’t get to give him a proper goodbye for all those years we’ve enjoyed his companionship. But I’m grateful for the memories made and I especially appreciate this past bonus year we’ve had with him. Six days later, after I’d raked most of the leaves in our yard and moved every storage box in the garage looking for Sammy with no closure made, my dad had a heart attack. Heart disease is unfortunately prevalent in my family. 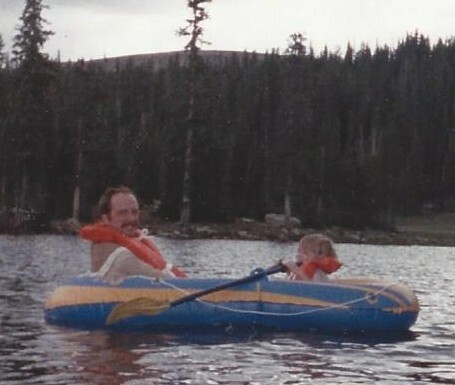 Dad’s first heart procedure was in 1985 – a triple bypass surgery. Then he was only 57 years old. In 1995 he had an heart attack and they put a stent in to correct the blokage. For the past year I’ve been going with Dad to his cardiologist appointments treating his heart murmur, a-fib and congested heart failure. I worried his heart was a ticking time bomb and I fretted about the when and how it would go off. Luckily it was a mild heart attack and not the massive one I feared. Over the next 6 days he had many tests and two procedures to create the best treatment plan for his heart problems. A heart valve replacement and a pacemaker were the remedies given and he made it through the surgeries with only one complication. His heart rhythm was off, so they had to give him a shock treatment which corrected that problem. We were relieved and expected to bring him home in a few days. On discharge day his heart went out of rhythm again and despite medication, they couldn’t get his heart to slow down. After two days another shock procedure became necessary. It did the trick and now we pray he can stay in rhythm. He is a miracle and we’re grateful for so many prayers which aided his recovery. Close calls like this make me realize how fortunate I am to have my parents. It renews my appreciation for their influence in my life and the foundation they set in building a strong family. I have wonderful siblings and collectively we support and unite, especially when one of us is in need. I’m blessed to go through life with them. As if the above wasn’t enough stress, Mark’s severe bladder infection and elevated PSA level led to more tests, which found a lesion in his bladder and an enlarge prostate. Surgery to fix both problems is scheduled the first week in December. An unfortunate side effect of Mark’s traumatic brain injury is seizures and they are more numerous when he has any other health issue. This month the seizures have come abundantly. “I’m not sure how that feels, but I assume it would feel pretty good,” I replied as my worries were lifted. I‘m fortunate to have a man that works through hardships with comedy. He’s a joy to be with and knows just how to lessen my concerns. I can’t blame Sammy for taking off. There have been days this month I wish I could crawl under a bush somewhere and not be found. I wonder if he sensed a different kind of turmoil than the weather storm that was brewing the night he left. I speculate he thought he’d do me a favor by leaving and give me one less thing to tend to. If this was he thought, he didn’t realize the hole in my heart he’d leave. The month of November encourages me to have a gratitude attitude. This month I’m thankful that despite the hardships and worries experienced, I still have a lot to appreciate! Tomorrow, November 12th, is Mark’s birthday and as I searched the internet looking for something which describes and honors him, I came up with these three things he does daily to make his life and mine wonderful. 1) Have a sense of humor. Mark has a great sense of humor, which makes living with him both enjoyable and entertaining. He makes me laugh in stressful times. No matter where we are he knows how to put strangers at ease with humor. When we left the hospital Friday, two nurses said, “I’m sure going to miss you here. You made me laugh and brought joy to my day.” He was going through a difficult, two day preparation before a colonoscopy, but still made the nurses laugh. 2) Never quit on what you want to achieve. Mark is a winner because he never quits. He keeps working on and believing in his abilities. His perseverance is an inspiration to all who know him. He works hard at everything he does and when he doesn’t accomplish what he’d hoped to, he works at not letting it get him down. I’m proud of his determination and positive attitude. I consider myself a winner also because I’m married to him. 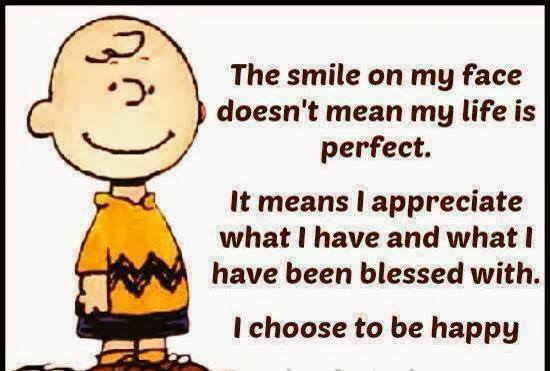 3) Choose to be happy. Mark definitely chooses to be happy. He has good reason to be sad and disappointed in life, but he chooses not to be. He forgives and forgets thoughtless comments. He’s never demanding and always appreciative of all that he has. He’s a joy to take care of because he has such a grateful heart, which makes it all worthwhile. For fun pictures of Mark in his youth click here. What makes your life wonderful? I’d love to hear your ways. I hope you have a great day which leads to a wonderful life! Continuation from June 15, 2014, Dad Creating Beauty After Tragedy. 1997 – Katie & Mark in Jamestown, VA.
Age fourteen was an especially rough year for me. 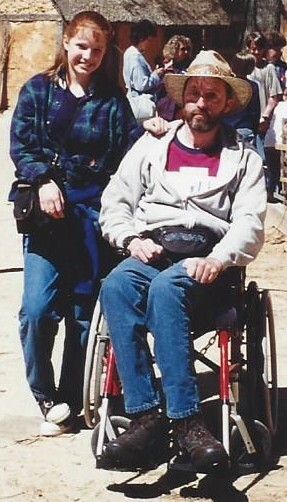 Dad had been in a wheelchair for half my life due to a traumatic brain injury from a car accident. He started having seizures, which always scared me. His memory was getting worse. 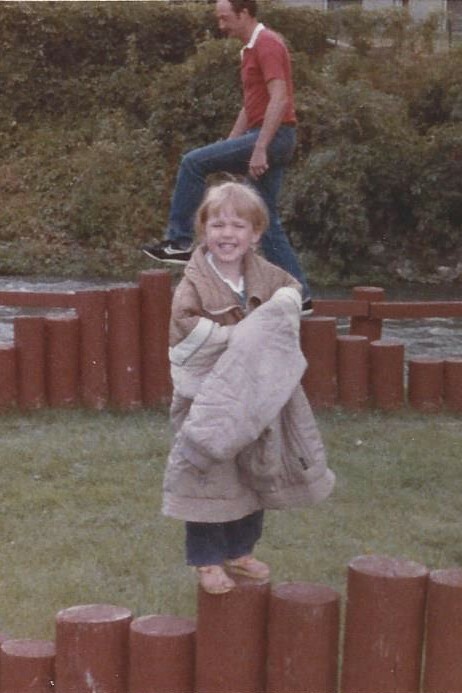 I felt frustrated when he couldn’t remember the name of the school play I’d been rehearsing for and talking about, but he could describe the swing he had as a child in detail. My parents always talked and acted as if Dad would regain all his abilities, but at age fourteen I started realizing life wouldn’t go back to the way it was before the car accident. I was angry with God and felt He abandoned us. I was grateful He spared my dad’s life, but I didn’t understand why He didn’t make Dad all better. He was working hard to regain all the abilities he once enjoyed. I felt my dad deserved more. About this same year, my family was driving to my cousins wedding reception and got lost. The stress of trying to find the venue and running late led us to argue. We finally arrived at the destination feeling tired and ornery. We were just in time to join the other guests in watching the bride dance with her dad. I looked at my dad sitting in his wheelchair and was overcome with jealousy. My heart broke as I thought I wouldn’t be dancing with my dad at my wedding. Emotion flooded my eyes with tears and I ran out of the room and into an empty elevator. As soon as the elevator doors closed, I lost all control and sobbed. I escaped back to my family’s van and hid there for the rest of the reception. “No. I mean what happened to you after?” She wanted to know how the car accident affected me. I don’t remember how I responded, but her question caused me to reflect on how my family had been served by so many people. I thought of how my brother and I stayed with our grandparents and extended family often while my dad was in the hospital. I had my own toothbrush at Grandma and Grandpa’s house and at my aunt and uncle’s house. My toothbrushes at both houses had my name written on with nail polish. This was a small thing which helped me feel at home in someone else’s house. When we stayed with my aunt and uncle, my cousins read to me from the book “Charlotte’s Webb.” This also helped me feel at home since I was use to my dad reading me bedtime stories. I have seen so much goodness in people because of my family’s experience. Some of my parents’ neighbors have generously given their time to help my dad with exercises on a regular basis – some of which have been doing it for more than seventeen years. Twenty-three years after their car accident, we are still blessed to have love and support from family and friends. I’ve been surrounded by angels my entire life, many are disguised as human beings. The biggest angel of all is my Mom. She has been my dad’s full-time caregiver and his biggest advocate. At one point during my childhood, she had three jobs to support our family while raising two kids and caring for my dad. I’m so proud of my mom. I used to say I wanted to be like her when I grew up. If I ever do grow up, I can only hope to have the strength and determination she has. I am grateful for all the years she has served and loved my dad. I don’t think any person can truly understand all the sacrifices she has made over the years. She has prayerfully fought her battles with grace and wisdom. I think my parents’ relationship is far more impressive than anything I’ve heard from a fairytale or seen in a movie. He replied, “Because I’m sitting next to the two most beautiful women in this room.” Dad’s so busy looking for the good in every situation he doesn’t have time to notice the bad. 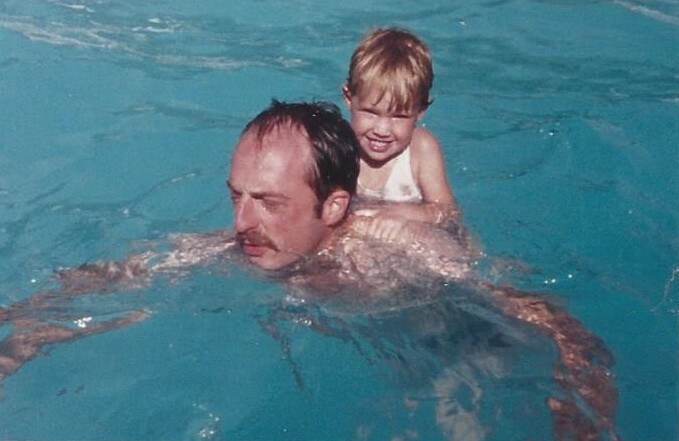 My dad has taught me the keys to happiness through his example. He chooses to be happy by having a sense of humor, being productive, forgiving, grateful and maintaining hope. My dad once said, “Adversity is the exercise that strengthens the muscle of character.” I think my dad’s muscle of character has Hercules strength. Thank you Katie for sharing more of your story. Teenage years are hard under the best circumstances. I’m sure your dad’s health and your mom being overwhelmed with responsibilities added to your stress. I’m grateful we all survived those hard years. From this article I learned a lot about your feelings and appreciated your honesty. I am proud of the resilient person you are and the sunshine you bring into my life as well as others. I’m so lucky you’re my daughter! When I was a child, I saw a few episodes of “The Joy of Painting,” featuring the famous landscape artist, Bob Ross. I thought the skinny white painter looked funny with his big brown Afro. His thick beard barely moved as he softly spoke about the different techniques and tools he used to paint. His serene ponds and lakes mirrored colorful trees and majestic mountains textured with highlights and shadows. Just when his paintings seemed perfect, he’d slap dark paint down his canvas. “No!” I’d holler in my head. “What are you thinking?” He disturbed the tranquility he’d just created with what seemed like an ugly mistake. He added highlights to the dark line, creating the texture of bark. He pushed his brush loaded with green paint against his canvas, creating speckles of leaves. He gradually turned the dark line into what he called a “happy little tree.” He transformed his canvas with a new kind of beauty. I don’t think life is ever picture perfect for anyone, but my early childhood was close. I grew up with two loving parents and a brother 16 months older than me. I was blessed with a healthy body and a comfortable home. The four of us loved dancing, biking, hiking, snowmobiling and three-wheeling. 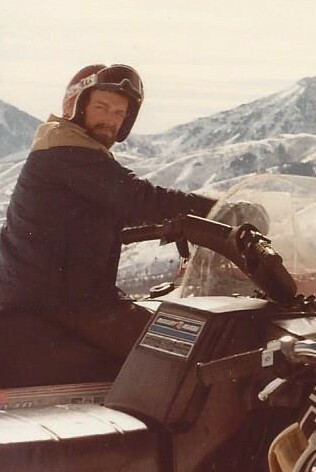 My dad was my favorite person to ride with on the snowmobiles and three-wheelers. He drove fast and took jumps even with his little girl’s arms squeezing his waist as she squealed behind him. The canvas of my childhood was transformed almost two weeks after my seventh birthday. My cousin was babysitting my brother and I while my parents were house hunting. The phone rang. When I got on the phone, I heard my mom’s voice crack. I could envision her chin quivering as it does whenever she starts to cry. “Your daddy’s hurt,” she said. I learned my parents were in a car accident. I didn’t know the extent of my dad’s Traumatic Brain Injury at that time. But if my mom was scared enough to cry, then so was I. I cried a lot that night. Days later, my mom sat at the kitchen table with the two of us kids. Her right arm was in a sling. She had my brother make a paper origami-like box, something he’d recently learned in school. She explained how a pickup truck hit our family’s small Hyundai on the passenger’s side where my dad was sitting. She pushed in one side of the paper box as if it were a replica of the damaged car. She explained the impact of the accident pushed the car across the intersection and into a light pole. She pushed in the other side of the paper box, indicating how the pole smashed the driver’s side of the car, just behind the driver’s seat where my mom was sitting. The impact caused my dad’s head to hit the inside frame of the window and then swing to his left and hit my mom’s right shoulder, shattering the right side of her collar bone. I later asked my mom if the man driving the pickup truck was in jail for hurting my dad. She explained the accident was a mistake. Nobody meant to hurt him. All I knew was my dad was in a hospital instead of home with his family. I thought someone should be punished for that. 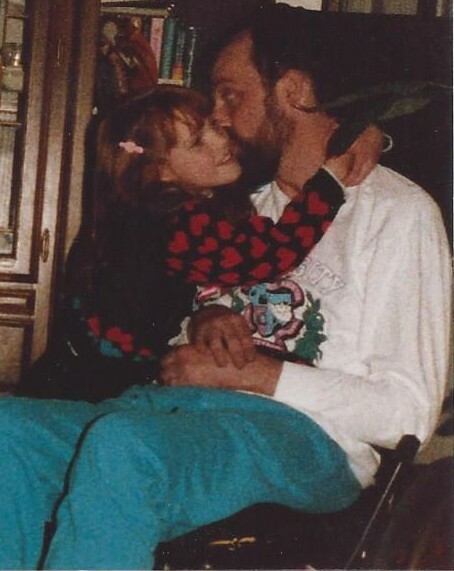 I didn’t get to see my dad for the first six weeks he was in the Intensive Care Unit because my mom thought it would be too scary for her little kids. That was a wise decision. He lay comatose in a rotating bed. He was hooked up to tubes and machines, which made unusual noises. One of those tubes was a shunt in his head to relieve fluid on his brain – something no child wants to see. 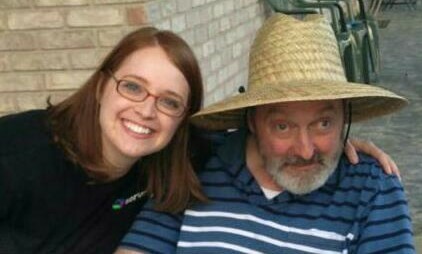 My mom decided it was time for us to see our dad after his condition became more stable and the shunt in his head was removed. He was still comatose, but I was excited to finally see him. My excitement shattered when I walked into his room. The man I once saw smash his finger with a hammer without shedding a tear lay helplessly unconscious. Tubes connected his lifeless body to machines. He was dependent on technology and the care of others. It was my first time seeing him vulnerable. I was scared. I recognized his face, but how could he be my dad? 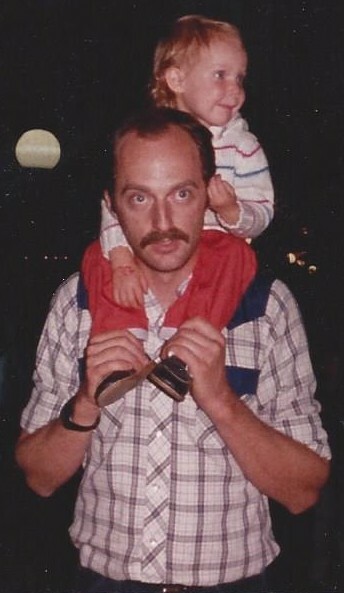 My dad was strong enough to lift me onto his shoulders so I could see parades over large crowds. My dad did sit-ups every night with his toes tucked under the couch as I sat on it and counted his sit-ups aloud. My dad killed spiders for me and read bedtime stories to me. I didn’t want to go near the lifeless body in the hospital bed. That night, my brother and I slept at my grandparents’ house like we often did after my parents’ car accident because Mom stayed at the hospital. My grandma prepared the sofa pullout bed and tucked us in under the covers. Instead of singing us lullabies, she quietly played the piano on the other side of the room. I slipped into dreamland. I dreamt I was sitting in the same bed I had fallen asleep in while wearing the same pajamas. My brother was sleeping to my right. When I looked to my left, I saw my dad standing – yes, standing – at my bedside! He looked tall and handsome in his Sunday suit. He didn’t say a word to me, but his warm smile soothed my fears and I was no longer afraid of him. 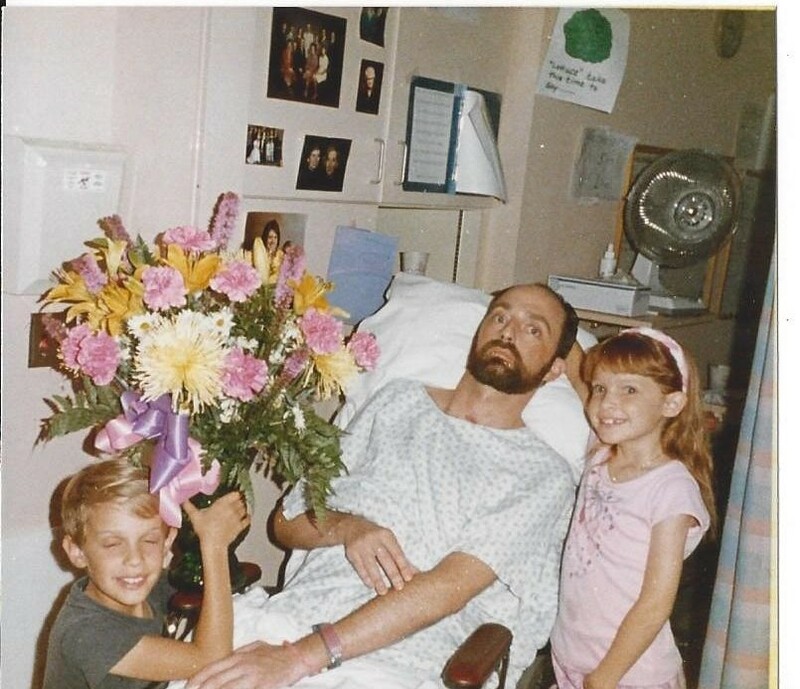 My dad was in a coma for three months and hospitalized for eight. He came home just in time for our family to spend Christmas together. 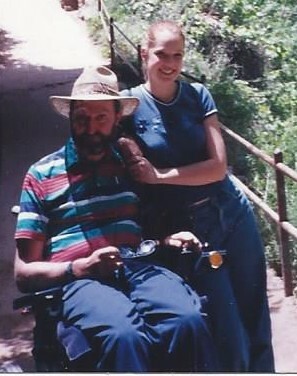 He was in a wheelchair and dependent on my mom’s care. 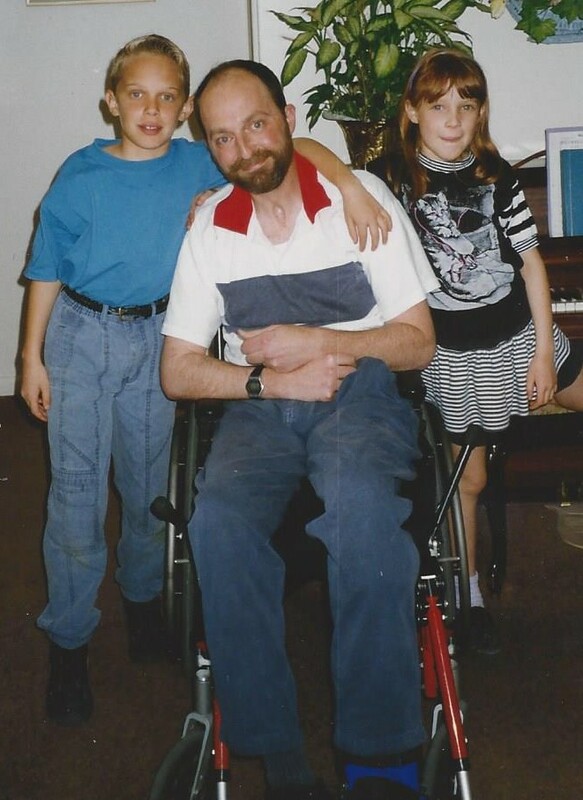 While growing up, some friends asked me what it was like having a dad in a wheelchair. My brother and I helped my mom dress and care for my dad, especially when he first came home from the hospital. I learned how to help around the house and be more independent at a younger age compared to most of my friends. 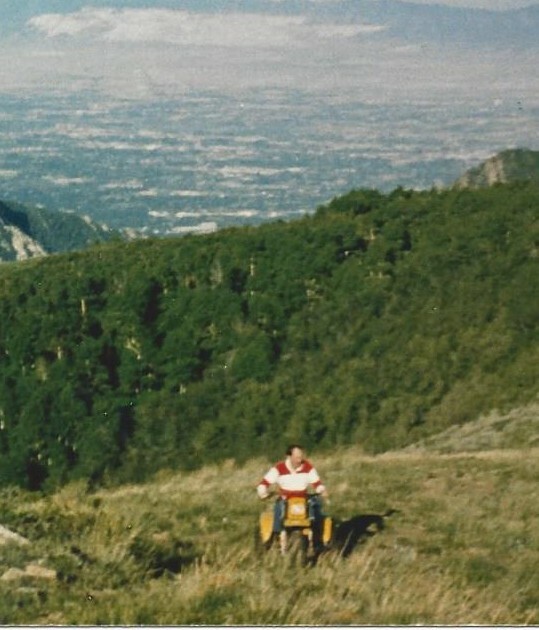 Our family could no longer dance, bike, hike and snowmobile together like we once could. The scene of my life drastically changed, and so had my dad’s. But like Bob Ross transforming a dark and ugly line of paint into a “happy little tree,” I saw my dad use his tragic and life-changing disturbance to create a new kind of beauty. My dad (who wasn’t expected to live) not only survived, but thrives with a positive attitude. I’m blessed to call him Dad. Next week, I’ll share how this transformation affected my life throughout my teen years and as an adult. Thank you Katie for sharing your story. You and Christopher have been our inspiration. Your encouragement and love kept us striving to do better and to never give up. While searching for the pictures to use, my “chin was quivering, just as it does whenever I start to cry.” My heart truly broke the day the accident happened. Not only for your dad but for you and Christopher too, but as you so elegantly reminded me—it’s a beautiful heartbreak. I’m so blessed and proud to be your mother! HAPPY FATHER’S DAY TO ALL THE GREAT DADS! I’m lucky to have one and to be married to another. I’m grateful for all the men in my life. November is the perfect month to count our blessings. 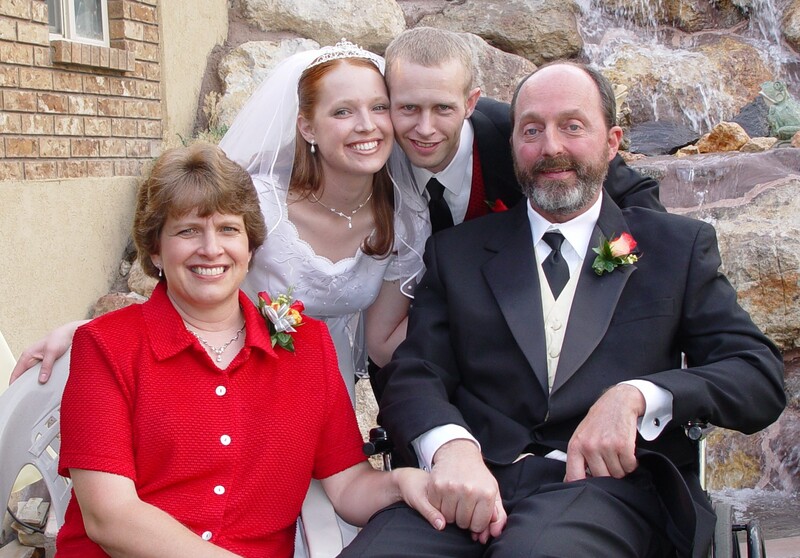 Mark has a wonderful ability to recognize blessings that have come from the car accident which left him wheelchair-dependent, living with seizures and speech impairment, all due to his traumatic brain injury. Mark says, “The accident has improved and strengthened my emotional well-being. I’ve learned not to be hurt as easily as before by comments made by other people.” People often say things without thinking. Mark chooses not to take offense but rather makes a joke of it. Because of Mark’s speech impairment, when he talk’s people look at him more intently – to understand what he’s saying. He counts this as a blessing and appreciates those who look him square in the eye and not off somewhere else. What a wonderful example he is: counting the blessings in his adversities and letting them strengthen his character. Just one reason why I love him so.